Even after Hurricane Harvey, the best efforts by Harris County officials to purchase the most flood-prone homes won’t make a dent in the larger problem — worsening flooding, and a buyout program that can’t keep up. HOUSTON — After four sleepless days fighting to keep her home dry during Hurricane Harvey, after losing her car, after nearly getting electrocuted by a fallen electric box as she waded through brown muck in what wound up being the third flood to hit her property in three years, Maurine Howard wants out. “I can’t go through this again,” she said. “I don’t have it in me.” The 2015 flood was minor enough she mopped it up with towels, but her house flooded badly last year when a city water pipe under her patio burst open during heavy rains. Then Harvey destroyed the entire first floor. Howard, a longtime nonprofit director who calls herself a “mouthy person,” left a message with the mayor’s office demanding that the government buy her house. Experts see buyouts as a cornerstone of disaster recovery, a way to take the most chronically flooded homes and turn them into open space so they can improve drainage and lower flood risk for the surrounding area. It’s hard to find another county in America that has accomplished more buyouts than Harris County. Since 1985, the Harris County Flood Control District — the main entity managing buyouts in the Houston area — has spent $342 million to purchase about 3,100 properties. But thanks to a decades-long trend of increased flooding in Houston, caused by a combination of urban sprawl, lax building regulations and intense rainstorms linked to climate change, buyouts haven’t kept up with the destruction. At the rate Harris County has been going, it would take more than three decades to acquire the 3,300-or-so homes on the district’s priority buyout list — a drop in the bucket compared to the number of properties that flooded these past three years alone. Hurricane Harvey damaged at least 69,000 properties in the county, according to preliminary figures that are likely an underestimate. Devastating floods also hit the county in 2015 and 2016. Despite the obvious need and high demand, Harris County is plagued by challenges endemic to buyout programs: limited funds, competing priorities, strict criteria that place buyouts out of reach of willing participants, and the snail’s pace of bureaucracy, which puts homeowners in limbo while creating opportunities for private developers to buy and flip flooded homes, perpetuating the problem. When Howard talked to the flood control district, officials said her case wasn’t a priority, she said. Even though her home has flooded repeatedly, and will likely flood again, it lies outside the 100-year floodplain, the high-risk zone designated by government flood maps. Howard, like thousands of other homeowners in similar circumstances, is likely ineligible for a buyout. “Where am I going to go?” she asked. “What am I going to do?” Her flood insurance won’t cover the scope of needed repairs, she said, and the Federal Emergency Management Agency gave her just $2,200 for rent — not enough for Howard and her boyfriend to put down a deposit and get a furnished apartment for a month. She still owes $270,000 on the house, which was appraised at $480,000 when she refinanced it two years ago, she said. A private buyer approached her in her driveway and offered her $175,000. Insulted, she turned it down. The Harris County Flood Control District keeps a priority list of homes “hopelessly deep” within the floodplain, in areas “where we don’t think we can fix the flooding problems,” said James Wade, the district’s acquisitions manager. These are homes that he said “never should have been built.” Officials say the majority were constructed more than three decades ago, before Houston adopted modern floodplain maps and stricter regulations about where and how developers could build. The district’s current $44 million buyout budget will be able to pay for only a few hundred homes — less than 10 percent of these prioritized properties. Wade said the district will offer pre-Harvey appraised value for each house, and there will be no penalty for homeowners who’ve used money from flood insurance claims to begin repairs. Local officials are asking for additional funds — a state plan released Tuesday called for several billion dollars in federal funding for buyouts in Harris County — but there's no guarantee Congress will provide the money, and frustrations are mounting as homeowners wait in limbo. Joe Rice volunteered for a buyout, and seems like the ideal candidate. But he remains cynical. “Personally, I don’t think it will ever happen,” he said. His house is in Meyerland, a southwest Houston neighborhood where water reached roofs and residents had to be rescued by fishing boats. His home lies deep within the 100-year floodplain, and has flooded four times since Tropical Storm Allison in 2001. 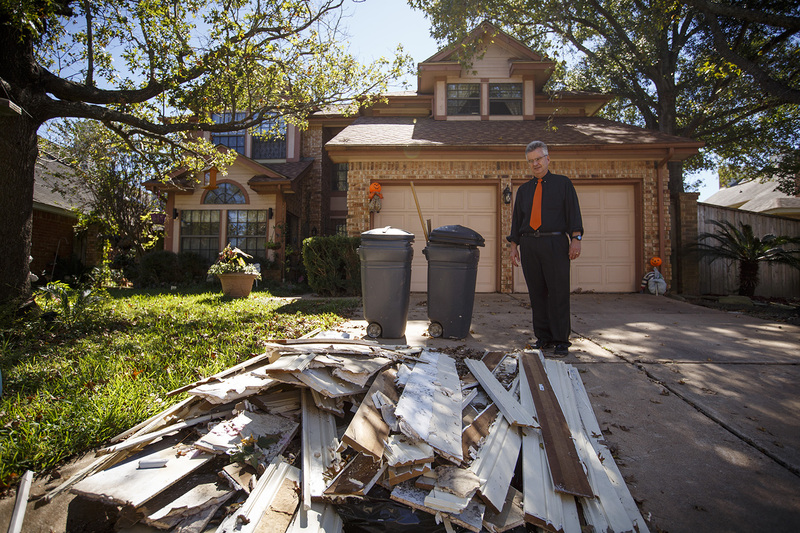 After the 2015 Memorial Day flood, which occurred shortly after his wife passed away, he got so overwhelmed, he abandoned the Meyerland house and moved to a less risky part of town. Funding streams are so slow, the district applies annually for federal buyout funds regardless of whether any part of Harris County has flooded that year. Sometimes, the county gets hit with additional floods as the applications wind through bureaucratic review. The $44 million buyout budget includes a $10 million grant Houston received from the Department of Housing and Urban Development after the 2015 floods and a $13.3-million FEMA grant from a routine application the district submitted in 2016. (The FEMA grant is accompanied by a $1.1 million local funding match.) The remaining $20 million comes from county funds released in September to speed up the buyout process. Another round of FEMA aid, greenlit after the 2016 Tax Day floods, is under review at the state level, said Wade, and the district is working on post-Harvey grant applications. The vast majority of FEMA’s funding for “mitigation”— a term that includes buyouts and other methods of flood control — is triggered by federal disaster declarations. Wade said it typically takes at least four months for FEMA to make those post-disaster funds available. The district is also applying for HUD grants, but HUD tends to take even longer than FEMA, said Brett Lingle, a senior researcher at the University of Pennsylvania’s Wharton Risk Center. By the time HUD money shows up, he said, many volunteers may have given up on buyouts. Flood control experts disagree on the best way to prevent future flood damage. Some say engineering solutions, like widening bayous and building detention basins to hold excess water during storms, can do the trick. Chad Berginnis, executive director of the Association of State Floodplain Managers, said many floodplain managers prefer buyouts. Yet the Governor’s Commission to Rebuild Texas, which was created after Harvey, plans to ask for far more money for engineering projects than buyouts across the state. The commission has said that of $61 billion in public infrastructure needs it has identified, about two-thirds of it is for major flood control projects and just one-third is for buyouts and elevation projects. Lingle’s research shows that Harris County has consistently prioritized flood control engineering over buyouts. Between 1989 and 2016, the county spent only 41 percent of its FEMA post-disaster mitigation grants on buyouts, or $161 million in today’s dollars. Forty-four percent of the grant money went to engineering solutions. Those methods have long been embraced by the Harris County Flood Control District, which was created in 1937 to help the federal government build such projects. The district has no power over land development, but is charged with reducing flood risk from bayous, streams and creeks. Ataul Hannan, the district’s planning division director, said buyouts and flood control are different ways of achieving the same goal, and they generally avoid using both techniques in the same area. Wade said the district prioritizes buyouts in neighborhoods where flooding can’t be fixed through engineering. That includes the White Oak Bayou and Greens Bayou watersheds north of downtown Houston, which have seen extensive flooding in recent years. Another watershed — Brays Bayou in the south — has similar flooding problems but got far fewer buyouts, because it has major flood control projects designed to make it less flood-prone. Hannan said the district will have invested close to $500 million in federal and local dollars in Brays Bayou by 2020, and a district report estimates that its investments so far prevented 6,500 homes there from flooding in 2015 and 2016. But an analysis by ProPublica and The Texas Tribune found that at least 4,000 Brays Bayou properties in the floodplain still flooded in those years, making it one of the most consistently damaged areas, worse than others with hundreds of buyouts. Other officials are concerned that buying out a significant number of homes in the Houston area will stunt the city’s growth and severely limit its tax base. Stephen Costello, the city of Houston’s “flood czar,” said he wants to use federal buyout funds to rebuild and elevate acquired homes to make them more resilient. Costello’s plan would be an unprecedented use of federal buyout money, requiring complex negotiations. A common complaint from Harris County residents seeking buyouts is the uncertainty over their likelihood of being selected. The district uses complex criteria to determine priority, and eligible homeowners may not get confirmation for months. As of last week, more than 3,400 homeowners had volunteered for buyouts with the district, Wade said, and only about one in five met the buyout criteria. There are no federal guidelines for buyouts, so local agencies “have a tremendous amount of flexibility in how they design those programs,” said Sherri Brokopp Binder, a consultant who studies buyouts and disaster recovery. The district’s priority list focuses on the most extreme cases within the 100-year floodplain. According to Wade, homes are likely to be prioritized if they’re in the floodway (the area right next to bayous and streams), in the 10-year floodplain (an exceptionally high-risk area designated on flood maps) or built on low-elevation land at least two feet deep within the 100-year floodplain. The boundaries of that floodplain have come into question as some experts have challenged the rainfall data and modeling used to produce those maps. Homes meeting these criteria are the most likely to pass FEMA’s benefit-cost analysis, which requires the price of acquiring the property to be less than the anticipated cost of paying future flood damage claims. The district also considers the house’s history of repeated flooding, and only commits to a buyout if the area is at least five acres in size, or if the district can acquire at least 10 connected properties of any size. Wade said the rules are flexible. For example, some houses are on the list simply because they’re located in neighborhoods that were substantially bought out after Tropical Storm Allison. And houses that don’t meet all the criteria may be eligible if they’re located next to a cluster of ideal buyout candidates. That still leaves many ineligible houses with repeated flooding. Michael D. Bolton, a landlord who lives outside the 100-year floodplain northwest of Houston, began asking for a buyout before Harvey hit. His house has been flooded so many times, it’s considered a priority for buyouts through FEMA’s flood insurance program. But he remains ineligible under the district’s rules. There are some indications that local officials are hoping to buy out properties outside the 100-year floodplain. The flood control district said Tuesday that it is requesting billions of federal dollars to buy out homes in the vicinity of two reservoirs west of downtown Houston, even though most of those homes aren’t in the floodplain. But it’s not clear whether Congress will fulfill that request. The buyout delays have created an opportunity for private developers looking to scoop up homes at bargain prices and flip them for profit. Eleanor Moler, a retired customer service supervisor, recently sold her flooded house near Buffalo Bayou to a private developer for a “decent” price. Moler said she wanted to get rid of the house as soon as possible, so there was no point in hoping for a government buyout. The repeatedly flooded house lies just outside the 100-year floodplain. The risk will be passed on to whoever buys the house next. Moler and her husband Frank were evacuated by boat during Harvey. It took 13 days for the floodwaters to drain from their house. By the time they got back, black mold was creeping up the walls, and they salvaged little aside from an antique desk, two tables and some photos. The Molers moved into a new house a few days ago — in an area of west Houston that stayed dry during the hurricane. Jamila Martinez wants to hang on long enough for a government buyout. Her mother’s house, which Martinez co-owns, flooded for the third time in three years with Harvey. 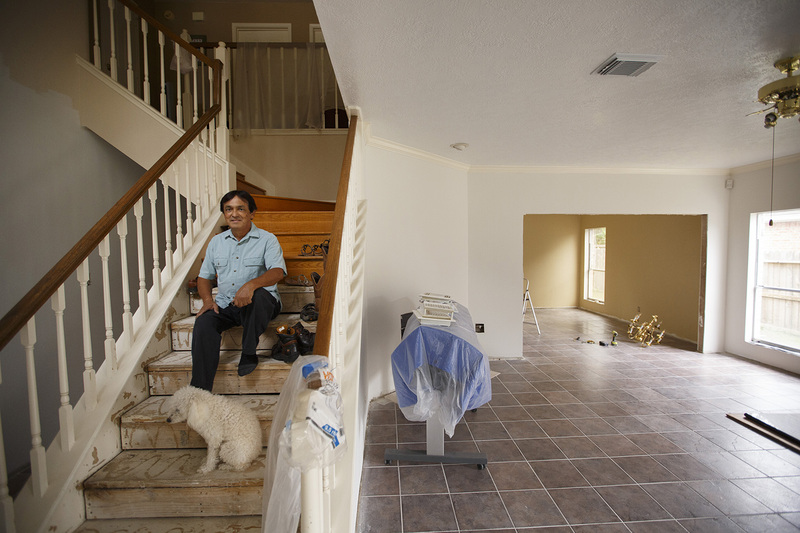 Martinez, an executive assistant at a construction company, lives elsewhere in Houston but is trying to ensure her mother won’t have to go through another flood. The property lies partly within the 100-year floodplain, so a buyout may be possible depending on the neighbors’ situations. “Being that this is our third time, we’re kind of pros at this,” Martinez said. They tore out the damaged drywall and insulation themselves before hiring a remediation team to finish the cleanup. Martinez volunteered for a district buyout and applied for a home elevation program through the city of Houston. She said she needs to take care of the house before April, in case another flood hits Houston next spring like it did last year. She’s determined to make a decision by January. What would a successful buyout program in Harris County look like? It’s hard to find one that matches the size of Houston’s problem. The city of Austin bought out almost all the homes identified as the most flood-prone in the Onion Creek neighborhood. The feat required about $100 million in local funding, from bonds and a citywide drainage utility charge, as well as a federal contribution of more than $40 million that came seven years after it was promised. The entire project, nearly completed this year, involved 823 homes — a quarter of Houston’s priority list. Even buyouts that look successful from a numbers perspective often hide deeper problems. Reducing flood risk comes at a cost, including lost property taxes and falling real estate values in neighborhoods dotted with vacant lots. Binder, the disaster-recovery consultant, said many homeowners who successfully relocated after Hurricane Sandy were unhappy with the lack of communication and transparency from the agencies handling buyouts. From the community’s perspective, buyouts are traumatic. “You’re asking people to willingly walk away from their homes.” Everything about them — their schools, jobs, how they spend their free time — is wrapped up in that, Binder said. She says she is trying to learn as much as she can about how buyouts affect communities, because there will come a day when certain flood zones will become uninhabitable thanks to climate change and sea-level rise. “We’re sort of facing down this future where [buyouts] might be less optional,” she said, “and more required." Kiah Collier from The Texas Tribune contributed to this story.